The aim of this programme is to give you the confidence and know how to start using Facebook to generate SALES for your business. 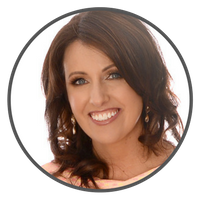 Consider these three simple questions…..
Do you feel you are wasting your time on Facebook? Are you finding it difficult to get a return from Facebook Ads? Are you unsure how to use Facebook strategically to drive sales? If you have answered yes to any of those questions – then this programme will help you. Are you ready to invest in you? To move outside your comfort zone and to have weekly accountability to drive you forward and start making real progress? I can honestly say that this is the best programme I have ever run. I basically join your team for the 6 weeks of the programme and help you every step of the way. The programme combines eLearning with weekly online live meetings (using Zoom) and a weekly video review of your progress. I follow your progress for the 6 weeks of the programme and you learn by “doing”. If you’re interested in making real progress and getting out of your comfort zone – then this course is for you! Membership of a private Facebook group with ongoing motivation and support. A weekly group Zoom meeting where you can have your questions answered and benefit from additional advice. A weekly video review of your Facebook page. This tracks progress, points out bad posting practices and gives ideas for future posts. This will really motivate and help you. 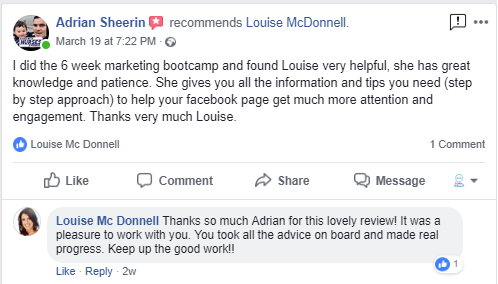 For the last three weeks of the programme a review is also carried out of your Facebook Ads Manager Account where feedback is given on audiences, campaigns, ad creative and results. A 24 page colour Facebook Marketing workbook where you can track your progress and develop your strategy. How to use Facebook ads effectively. The tutorials are between 30 and 45 minutes in duration and each week participants have simple, practical tasks to compete. People that have completed this programme has started seeing results straight away. The real benefit is that participants learn one aspect of Facebook marketing at a time. The programme costs €899 per participant. The next start date is the 5th of May 2019. Feedback from businesses that have completed this programme has been phenomenal! As the course is spread out over 6 weeks, businesses can focus on one aspect of Facebook marketing at a time. 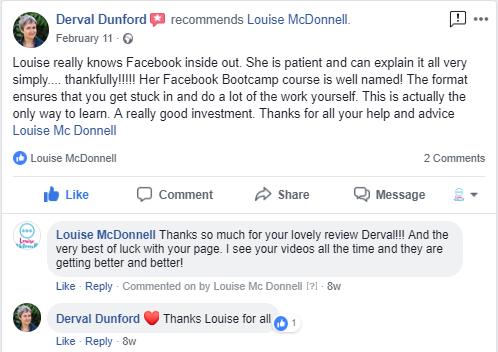 The ongoing support and camaraderie through the private Facebook group helps motivate and drive participants to push the boundaries of their normal social media activity.